A journey may take hundreds of miles, or it may cover the distance between duty and desire. Sixteen of today’s hottest writers of paranormal tales weave stories on a common theme of journeying. Authors such as Kelley Armstrong, Rachel Caine, and Melissa Marr return to the beloved worlds of their bestselling series, while others, like Claudia Gray, Kami Garcia, and Margaret Stohl, create new landscapes and characters. But whether they’re writing about vampires, faeries, angels, or other magical beings, each author explores the strength and resilience of the human heart. 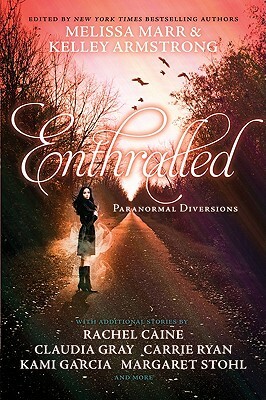 Suspenseful, funny, or romantic, the stories in Enthralled will leave you moved. Melissa Marr is the New York Times bestselling author of the Wicked Lovely series as well as the adult fantasy novels Graveminder and The Arrivals. When not traveling, Melissa can be found in Phoenix or online at www.melissamarrbooks.com. When librarians finally granted Kelley Armstrong an adult card, she made straight for the epic fantasy and horror shelves. She spent the rest of her childhood and teen years happily roaming fantastical and terrible worlds, and vowed that someday she'd write a story combining swords, sorcery, and the ravenous undead. That story began with the New York Times bestselling Sea of Shadows and continues with Empire of Night. Armstrong's first works for teens were the New York Times bestselling Darkest Powers and Darkness Rising trilogies. She lives in rural Ontario with her husband, three children, and far too many pets. Sarah Rees Brennan was born and raised in Ireland. After earning her master's in creative writing in New York and doing library work in Surrey, England, she has returned to Dublin, Ireland, to write. She is the author of the novels The Demon's Lexicon, The Demon's Covenant, and The Demon's Surrender, and her short story "Let's Get This Undead Show on the Road" appears in the collection Enthralled: Paranormal Diversions.